Completely Updated. Meticulously Maintained. 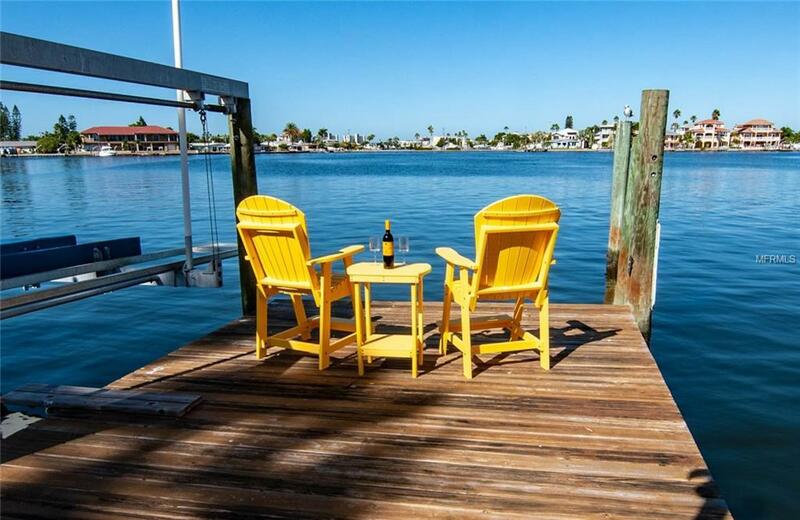 This 3BR, 2BA, 2-car garage, waterfront home boasts a pool, 10K boat lift and STUNNING updates in every room. The kitchen features custom cabinets, granite counters, stainless steel appliances and a gorgeous layout. The open floor plan and picture windows integrate the interior space with the spectacular outdoor features of this home. The views are incredible. The master bedroom has an en suite bathroom with incredible views and a walk in closet. Both bathrooms sparkle with tile, vanities, and fixtures. The entire home has been updated with Italian porcelain flooring, fresh interior and exterior paint, dimmable LED lighting, and ceiling fans. MORE UPDATING includes.....a new saltwater pool sytem and pump, a new tankless hot water heater , new hurricane windows/skylight/door/garage door, a new sea wall cap, a new 200 amp electric panel, and an updated 10,000 lb boat lift. Sunset views and boating from your backyard, very close to John's Pass and amazing beaches, and a short drive to downtown St. Petersburg. This home has everything..plus paradise.